As the perfect complement for other LC models or alone: The LC2 sofa is a real eye-catcher in the typical style of the 20s and 30s Bauhaus style. Based on sketches by Charlotte Perriand the sofa design was developed by the architect Le Corbusier as a pioneering avant-garde project. Today the LC2 furniture are part of modern and exclusive interior design. The LC2 sofa is extremely comfortable, the great comfort of the luxurious soft cushions is further enhanced in the model with down filling. The sofas, chairs and stools of LC2 series were often copied but the excellent workmanship and durability of the original Cassina furniture were never reached. 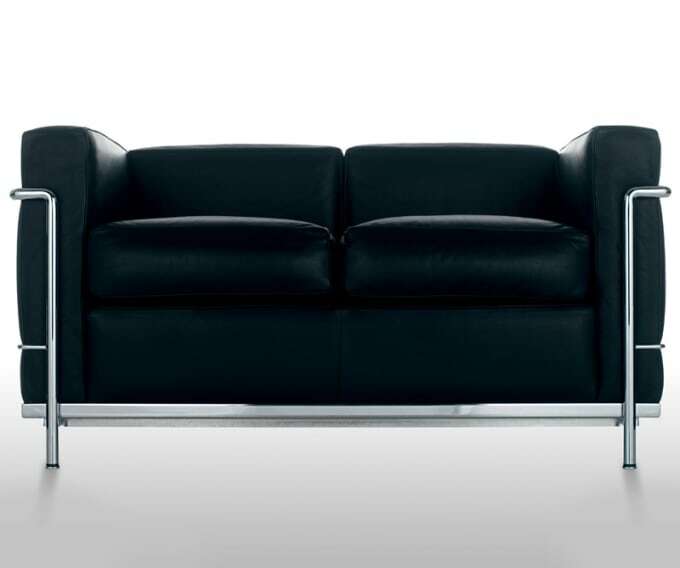 Sofa with steel frame, polished chrome plated or bright basalt, grey, light blue, green, claret and ochre or matte black lacquered steel frame. Loose cushions with polyurethane and polyester or down padding. Leather or fabric upholstery. Do you have a question about "LC2"? How can we contact you?